There isn’t a great deal of orthodoxy in the story of how Samphire Festival came to be. Founded last year by Flora Blathwayt and Josh Beauchamp – both romantic partners and total newcomers to the industry – the festival has already broken a Crowdfunder record, won a NOEA award for Best Small Festival, and enjoyed a sell-out debut edition. 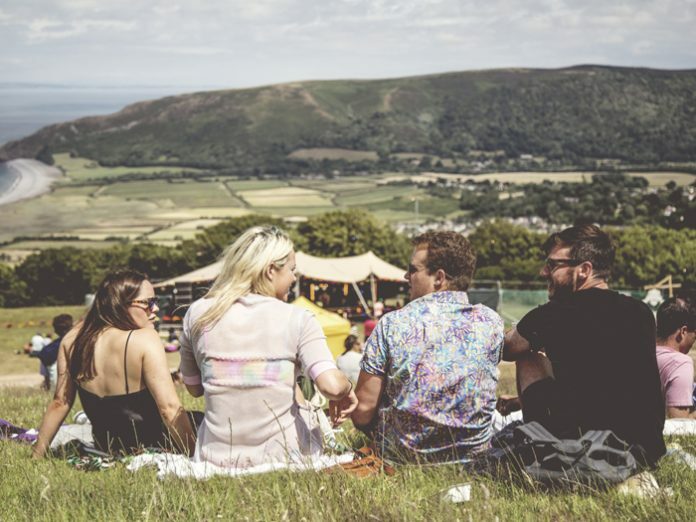 Its remote and picturesque site within Exmoor National Park presents a potential for escapism that surpasses most other festivals, and its second edition promises to expand on what made the first so beloved from July 7 – 9. Insights spoke with Blathwayt and Beauchamp about their motivations for launching the festival, how they’ve been able to effectively transcend their limitations, what they’ve got planned for this year, and more. Festival Insights: Launching a festival with no prior events experience isn’t the most obvious career move. What was the inspiration for launching Samphire in the first place? 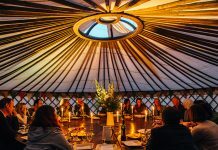 Flora Blathwayt: Well shortly after Josh and I started going out I took him down to Exmoor National Park – a location in which my siblings and myself have always shared a pipe dream of hosting a festival. When he saw it he suggested we do exactly that. Josh Beauchamp: We were both at a crossroads and in-between jobs, which helped. We were looking for something new to sink our teeth into. When we visited Exmoor, we decided then and there that we were going to start a festival. We had no idea what the process would entail. FB: We were totally blind. But once we started on the festival it quickly snowballed. FI: The lack of prior experience would inhibit most festival organisers enough throughout the organisational process, but I imagine working so closely with a partner must be trying at times as well. FB: I honestly think it must be the most stressful job you can do with a partner. Somehow we’ve got through 18 months of it so far though. JB: We do have very difficult skill sets and focus on different areas though; I think that helps a lot. Our roles overlap to an extent but we don’t tend to get in each other’s way. If there’s something I can’t do and Flora can then she just takes it off my hands. FB: It can be an incredibly time-consuming job, which I’m sure is par for the course in this industry. The festival is always on our minds and we’re always talking about it, which must be unhealthy, but despite the stress and the hurdles this is what we both want to do. FI: Considering the inaugural edition’s sell-out success, do you think your lack of experience and relationship status ended up being blessings in some ways? What else about the festival led to its early success do you think? JB: I actually think the lack of experience was a big help at the very beginning. If we knew from the start everything we’d have to accomplish in the first year alone it might have been enough to scare us off. Instead we were able to focus on it piece-by-piece. FB: As for our relationship status, it helps because we can work on the festival constantly. We don’t go away to separate homes and so if there’s a problem at hand then we can sort it out instantly. That said, it was of course impossible for the two of us to do this alone. We had a lot of help in the first year. For example, we very quickly realised after our Crowdfunder campaign last year that we were over capacity for our Temporary Events License. Fortunately, a friend of a friend is a licensing consultant and helped us for an unbelievable rate. He’s been so helpful not just on that particular issue but in being a mentor to us. If we’re stuck in the dark we ask him for advice. If someone’s trying to take advantage of us then it’s very good to get a second opinion and he’s able to tell us if we’re being mugged off. I might say to him “Oh we’ll just have another bar here”, and he’s quick to point out the additional considerations like security, for example. Across the board, he’s been invaluable. We’ve been to lots of festivals and in their first couple of years they can be great but slightly shambolic. The operation of ours somehow went really smoothly, and a big part of that is due to him and the team we built. FI: In financing the event you ended up breaking a Crowdfunder record. Could you tell us more about the specific record you broke and also what rewards you offered your supporters? 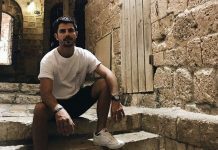 JB: The specific record we broke was becoming the fastest funded festival on the platform, hitting our target of £20,000 in less than three weeks. We had no other financial backing and so we had to be able to persuade enough people to fund it before we could get the ball rolling. We set the ticket price at £65, and then we offered a £100 ticket to 100 people that included a lifetime membership to Samphire, and called it the 100 Club. By paying an extra £35 last year those supporters are now entitled to discounted Samphire tickets forever and as the festival grows the benefits will accumulate. It was a big success; those 100 people felt very connected to the brand through it and sort of became informal ambassadors for us. FB: We also didn’t take the rewards too seriously. If people pledged about £30 they could put their own face or that of a friend on the side of a portaloo. Another reward tier allowed you to name a cocktail after someone. Not all of the reward tiers were incredibly lucrative but they were great at getting people talking. FI: Why do you think it is that people put that faith in you, considering that Samphire had no pedigree by that point? JB: Well we’d spent a lot of time talking to people for about three or four months beforehand, putting in enough groundwork so that when we launched the campaign we were able to be relentless with the press. We already had a firm narrative in place by then that we were ready to tell. FB: We ensured we had lovely branding and a well-made video as part of that story. It was hard though, it just being us. We had no PR and so to generate that level of hype was quite the achievement. JB: The scale helped too of course, it being 1000 capacity. As it was new we also had loads of friends and family there. From our data last year I’d estimate that we knew about 50% of the people in attendance, which I know is how parties often start, but now we’re presented with the problem of drawing in new audience members. We want it to be a bit bigger and we’re realising how hard it is to market festivals to people; there’s so much choice out there. FI: So let’s talk about some of the marketing techniques you’ll be using to get the word out. I understand some of your approaches are quite unorthodox. JB: Well yes. Without any marketing expertise or a budget then you’re bound to come up with some bizarre ideas. We’re not following a school of thought or anything. Every time we leave the house we have a bag full of flyers and we’re constantly thinking of new ways to talk to people. Marketing presents a huge learning curve. Something we tried this week was travelling down the West Coast with a pressure washer, temporarily inscribing our logo and date into the pavements of about 14 towns. It’s referred to as ‘clean advertising’. We asked for permission from local pub owners if we could do it on the pavement outside and offered free tickets to Samphire in return. FI: Samphire’s second edition will occur from July 7 – 9, so let’s talk about what you have planned. What areas are you expanding upon this time round, and what are you particularly excited about? FB: The thing we’re most happy with is that we received a grant from the PRS For Music Foundation. We put a big emphasis on hosting emerging artists, and that programming at least partially resulted in us getting the grant. We had two stages last year: the main stage, that runs until midnight, and a dance stage that goes until 5am. This year we have two new stages, one of which will be called The Legless Mermaid and will be curated by a lecturer from BIMM. JB: The site we’re on is a dark-sky preserve and so you can see the Milky Way at night – it’s awesome. We’re trying to superimpose visual elements onto the wilderness within the site. We’ve got a guy coming in who will be projecting graphics onto the tree canopies, for example. As for activities, we’ll have immersive theatre and games, such as a massive hillside game of Snakes & Ladders with slides and giant dice. We also have a new venue that has talks and films going on. FB: I’m really excited about the food too; three of our traders have won national street food awards. From the music to the activities, the food and the way we make the most of the site, I think Samphire is a great all-rounder.